Hamilton County Schools is looking for top teaching talent for classrooms this fall. The district will hold the Spring Teacher Hiring Event expected to attract experienced teachers and soon-to-be college graduates with an education degree interested in teaching in Hamilton County Schools. East Brainerd Elementary School will be the location of the event scheduled for Saturday, Feb. 23, from 9 a.m.-noon. Principals from Hamilton County Schools and district hiring managers will be at the event prepared to offer teaching and staff positions to certified teachers, support staff, speech/language pathologists and school psychologists. The event attracted more than 200 applicants last year, and organizers expect more than 250 this year. "Hamilton County employs over 3,000 excellent teachers and is looking to hire around 300 more dedicated classroom professionals to serve the children of our community for the 2019-2020 school year," officials said. "The spring event is one of many approaches the district uses to attract talented teachers to Hamilton County Schools. The event traditionally signals the beginning of the hiring season for the district. However, new recruiting efforts and the need to seek out the very best teachers for the children of the community have placed the district’s Human Resources Department in full hiring mode in advance of the Spring Hiring Event." "A goal in Hamilton County Schools is recruiting and hiring top talent, and retaining talented teachers already in our schools," officials said. "The district offers competitive compensation and rewards, first class professional development and opportunities for professional growth in a teacher’s career. Supporting teachers in Hamilton County classrooms is important in retaining top teaching talent. "District-wide teacher support efforts were also enhanced in 2018. Hamilton County Schools’ launched the New Teacher Academy to provide an introduction to the district to new teachers in the system along with providing each a mentor teacher. The New Teacher Network was also developed to continue support for the teachers throughout the school year." - Apply for open positions at www.hcde.org/careers. 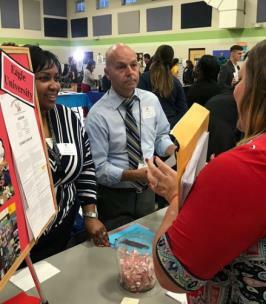 “We look forward to meeting the promising future teachers of Hamilton County Schools at the Spring Hiring Event and talking with them about the difference they can make In the lives of the children of the community,” Mr. Fogleman said. East Brainerd Elementary is located at 7660 Goodwin Road in Chattanooga.